CR2 (Canon Raw Version 2) is image format used for images created with Canon Digital Camera. CR2 is RAW image data directly out of the camera sensor. A RAW image file contains minimally processed data from image sensor of digital camera or motion picture film scanner. These files are named RAW because they are not processed and are not ready for printing or editing with bitmap graphic editor. RAW files contain information required for producing image from camera sensor data, that can be viewable. Raw file structure contains short file header, camera sensor metadata, image metadata, image thumbnail, full size JPEG conversion of image, file sequence and the sensor image data. 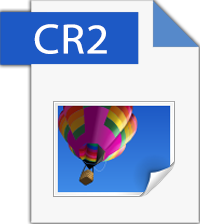 CR2 as many other raw file formats is based on TIFF file format, so usually these images are high quality, uncompressed and large. CR2 file format is used by Canon since 350D, 20D, G9 and 1d Mark II models. Before that, in older models, Canon used CRW format, which is based on Camera Image File Format (CIFF). RAW files also can contain text information about picture and camera conditions when picture is taken. Images in RAW formats can be edited in much more details with less loss of quality. Much of this information is lost after RAW image file is compressed and converted to JPEG or another image format. Because of this extra information stored in CR2 files, make this Canon Raw images favorite in astrophotography because in post processing can be saved much more details of objects. Also, CR2 offers and great flexibility with exposure times which does not increase too much noise level or effect dynamic range when increasing brightness and contrast to image. How to open CR2 file?